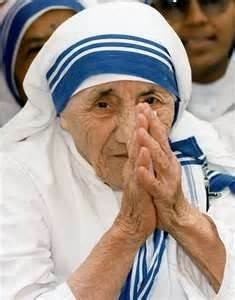 A challenge from Richard Rohr’s meditation today: W hy is it that Mother Teresa could stand up before crowds of thousands and repeat simple New Testament phrases and seemingly pious clichés, and still blow people away?! She didn’t say anything new: “Jesus loves you,” she assured us. “We’re all sons and daughters of God, and we have to love Jesus’ poor.” Yet people walked out renewed, transformed, and converted. She wasn’t a priest or minister. She wasn’t well educated. Her authority came from her lifestyle, her solidarity with human suffering, and thus her pure goodness. This entry was posted in -, faith, life by robryan65. Bookmark the permalink.